Our 2014 Seasonal Program, in conjunction with the Children's Aid Foundation of Halton, has now wrapped up. As in previous years, we are extremely overwhelmed by the generosity of the Halton community. There were 148 donors who provided toys, clothing, gift cards, bikes, helmets and locks to over 600 individuals and families. 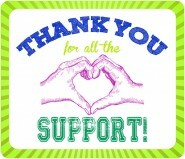 Thank you so much for your support and helping the children, youth and families in Halton thrive!